대불정여래밀인수증요의제보살만행수능엄경은 줄여서 ‘대불정수능엄경’또는 ‘능엄경’이라 부르기도 하는데, 부처님의 말씀을 머리 속으로만 이해하는데 그치지 않고 자신이 직접 경험하여 얻을 것을 주요사상으로 하고 있다. 능엄경은 전 10권으로 되어 있으며, 스님들이 수련과정에서 필수적으로 배우는 경전이다. 닥종이에 찍은 목판본으로 권4·5·6·7의 내용과 권8·9·10의 내용을 2권으로 엮었으며, 책의 크기는 세로 26㎝, 가로 16.7㎝이다. 이 책은 고려 공민왕 21년(1372)에 대장군 김호와 영암군부인 최씨, 정순옹주 이씨 등에 의해서 간행되었으며 찍어낸 시기는 조선 전기로 추정된다. 검푸른 색의 표지에 제목은 금색 글씨로 썼고 보물 제689호와 같은 판에서 찍어낸 것으로 보인다. The Shurangama Sutra (Sutra of the Heroic One) is one of the texts that all Buddhist monks are required to study. The sutra emphasizes the importance of going beyond intellectually understanding Buddha’s teachings to assimilate them such that the seeker of enlightenment can draw strength from them. 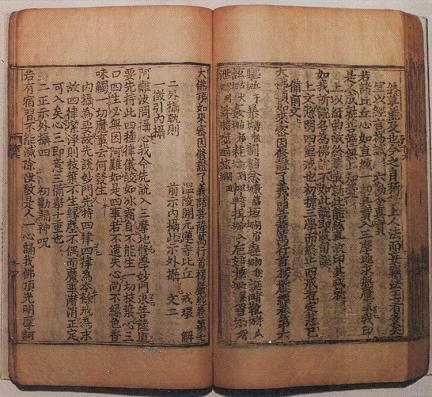 Printed on mulberry paper using woodblocks, these books measure 16.7 cm wide and 26 cm long. The woodblocks were engraved with the support of Kim Ho, Lady Choe, and Princess Jeongsun in 1372 (21st year of the reign of King Gongmin of the Goryeo Dynasty), and the books were published in the early Joseon Period. The title is written in gold on dark blue cover.